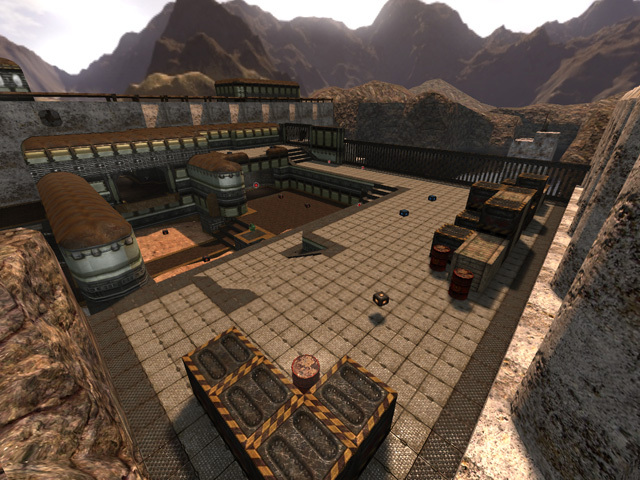 Blurb Small ffa/insta Sauerbraten map for 2-4 players. This is a small map set out overlooking a small dock. Good for ffa/insta with 2-4 players. maybe a bit less health or ammo near the yellowarmour, but thats it. The broken parts look great ! And yes, i also think that parts of a map which you could reach easily shouldn't be clipped (roofs). Also, i'm not sure about the pickups...in one room, there are 2 cartridges next to each other, which seems kinda useless. The surrounding of the map is very nice, it's just cool if you have sth to look at, other than if it's just a closed room with solid walls. i realy like the texturing and lighting of the map :D! the gameplay could be better, by clipping a bit less of the roofs, and delete those cartridges (no one really got much on it, you already get 40 shooting times with the pistol when you respawn) and take 1 of the 2 shotgun ammo in the middle away, so it looks like that you got a bit less ammo. Really would like to see that the 3 health next to each other, could be a bit more spread out (like for replacing that 1 shotgun ammo in middle, for 1 health). details are really done well to :D.
anyways great map :D 4/5, would like to give 5/5 for it, if do something about the clipping and ammo :D.